Compatible With Microsoft Xbox 360. Never runs out battery again while you are about to strike your final score. Cable length: Approx. as we would love the opportunity to make things right. So buy it confident. 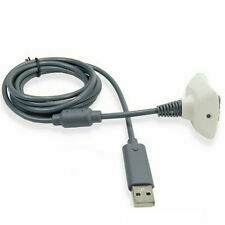 Free Gift (2pcs USB CABLE). 2 x USB cable. Color: Black. Top quanlity. Top quality product. Charge your controller directly with the cable. It will charge your Xbox 360 wireless controller while you're playing when it's plugged in. Can charge even when is playing. One side connects to the console and another connects to the USB port. Package Content: 1 x cable Note: Light shooting and different displays may cause the color of the item in the picture a little different from the real thing. The measurement allowed error is /- 1-3cm. Brand Unbranded MPN Does not apply UPC 190268830256 EAN 190268830256 ISBN 190268830256. Compatible With Microsoft Xbox 360. Never runs out battery again while you are about to strike your final score. as we would love the opportunity to make things right. Work temperature: 0-70 Centigrade. Charge your controller directly with the cable. It will charge your Xbox 360 wireless controller while you're playing when it's plugged in. Can charge even when is playing. One side connects to the console and another connects to the USB port. Package Content: 1 x cable Note: Light shooting and different displays may cause the color of the item in the picture a little different from the real thing. The measurement allowed error is /- 1-3cm. UPC 190268830249 EAN 190268830249 IABN 190268830249 MPN Does not apply Brand Unbranded. For XBox360 Play. Color: Black. Top quanlity. Top quality product. DO NOT DUPLICATE OR COPY! Why buy from us ?. It will takes about. [Installation and usage]. We will dispatch the item in 24H. 4 X Xbox360 battery. FAMILY OR FRIENDS ! #8 in Xbox 360 Cables. Cable Length: 1.5M. Color: Grey. Why Buy From BirdOnAWire?. Charge your controller directly with the cable. It will charge your Xbox 360 wireless controller while you're playing when it's plugged in. Can charge even when is playing. One side connects to the console and another connects to the USB port. Package Content: 1 x cable Note: Light shooting and different displays may cause the color of the item in the picture a little different from the real thing. The measurement allowed error is /- 1-3cm. UPC 190268830256 EAN 190268830256 ISBN 190268830256 MPN Does not apply Brand Unbranded. Charge your controller directly with the cable. It will charge your Xbox 360 wireless controller while you're playing when it's plugged in. Can charge even when is playing. One side connects to the console and another connects to the USB port. Package Content: 1 x cable Note: Light shooting and different displays may cause the color of the item in the picture a little different from the real thing. The measurement allowed error is /- 1-3cm. MPN Does not apply Brand Unbranded UPC 190268830256 EAN 190268830256 ISBN 190268830256. Charge your controller directly with the cable. 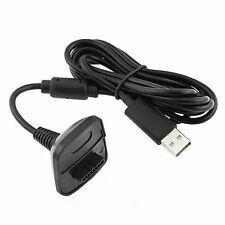 It will charge your Xbox 360 wireless controller while you're playing when it's plugged in. Can charge even when is playing. One side connects to the console and another connects to the USB port. Package Content: 1 x cable Note: Light shooting and different displays may cause the color of the item in the picture a little different from the real thing. The measurement allowed error is /- 1-3cm. MPN Does not apply Brand Unbranded Designer/Brand Unbranded EAN 190268830256 ISBN 190268830256.